On August 8, 2016, we will all be in “in the red” and in debt to mother nature since we will have used as much from nature as our planet can renew in the whole year. Australia is ranked worst – we use the equivalent of 5. 4 earths in terms of the ecological resources and services than nature can regenerate through overfishing, overharvesting forests and emitting more carbon dioxide into the atmosphere than forests can sequester. 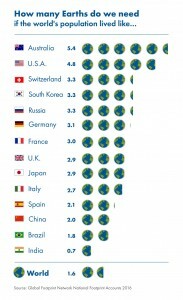 According to data from Global Footprint Network, Earth Overshoot Day, is happening earlier each year. This year it falls on 8 August this year – it’s the date when humanity’s annual demand on nature exceeds what Earth can regenerate in that year. This is possible because we emit more carbon dioxide into the atmosphere than our oceans and forests can absorb, and we deplete fisheries and harvest forests more quickly than they can reproduce and regrow. Carbon emissions are the fastest growing contributor to ecological overshoot, with the carbon Footprint now making up 60% of humanity’s demand on nature, which we call its Ecological Footprint. If we adhere to the goals set by the Paris climate agreement adopted by nearly 200 countries in December 2015, the carbon Footprint will need to gradually fall to zero by 2050. This calls for a new way of living on our one planet. Fortunately, some countries are embracing the challenge. For instance, Costa Rica generated 97 percent of its electricity from renewable sources during the first three months of 2016. Portugal, Germany and Britain also demonstrated groundbreaking levels of renewable energy capability this year, when 100% of their electricity demand was met by renewables for several minutes or, in the case of Portugal, for several days. In China, meanwhile, the government has outlined a plan to reduce its citizens’ meat consumption by 50%, which it calculates will lower the carbon dioxide equivalent emissions from China’s livestock industry by 1 billion tonnes by 2030. Simultaneously, as individuals, each of us has the power to act for change in our daily lives. Building on the momentum of the historic Paris agreement, Global Footprint Network and its 25 Earth Overshoot Day partners launched a public engagement campaign with a view to highlighting the significance of resource security in a sustainable world where people and planet thrive. As the global population has grown and consumption has increased – particularly with respect to carbon emissions – Earth Overshoot Day has moved from late September in 2000 to August 8 this year. On a positive note, the rate at which Earth Overshoot Day has moved up on the calendar has slowed to less than one day a year on average in the past five years, compared to an average of three days a year since overshoot began in the early 1970s. “The Paris climate agreement is the strongest statement yet about the need to reduce the carbon Footprint drastically. Ultimately, collapse or stability is a choice,” said Wackernagel.